Elizabeth Arden FLAWLESS FUTURE Powered by Ceramide Night Cream 50ml is an intensely hydrating night-time facial moisturiser with Ceramide, featuring mineral-rich botanical and exclusive fragrance technology to calm the senses and promote feeling of relaxation. Elizabeth Arden FLAWLESS FUTURE Powered by Ceramide Night Cream brightens the skin and supports the night-time renewal process, helping to counteract the visible effect of stress on the skin while evening tone and diminishing the appearance of fine lines. Elizabeth Arden FLAWLESS FUTURE Powered by Ceramide Night Cream 50ml was found on 4 websites and was price compared using EAN: 0085805541521. 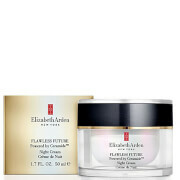 The cheapest Elizabeth Arden FLAWLESS FUTURE Powered by Ceramide Night Cream 50ml is shown as the main item, prices range from £42.00 to £42.00, excluding delivery. Price comparison based on price and delivery charges, with any valid discount codes being applied, is shown in the table above. Prices and information correct at the time of publication.